If your aquarium is between 55 – 75 gallons you’ll likely need a 200W Aquarium Heater to keep your tank comfortable and warm for your little fish buddies. Aqueon Pro 200W aquarium heater: Best Overall Most Recommended! Eheim 200W aquarium heater – A Long Lasting Splurge! But what features should you look for before you buy a new aquarium heater? 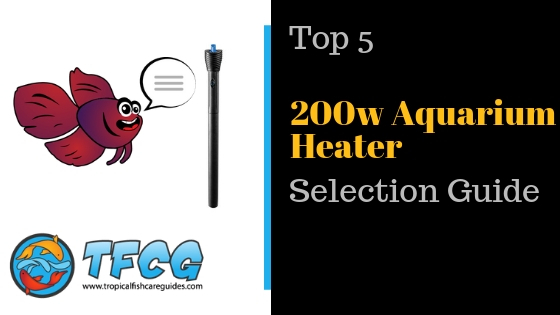 We have reviewed five of the best 200W aquarium heaters and highlighted all the benefits each one has to offer. The Aqueon heater works great for tanks up to 75 gallons, comes with suction cups and can be fully submerged if needed. It also has a min water level line so that if the water drops below this line the heater will automatically shut off to prevent overheating and possible blow out. I used one of these heaters for almost 5 years and then suddenly it stopped working. So I called Aqueon and then sent me a new one completely free! I believe Aqueon to truly stands behind their product and because of this would not hesitate to recommend this 200W aquarium heater. Built-in mirrors help blend the heater into your aquarium. Very slim design for easy placement you won’t know it’s there. 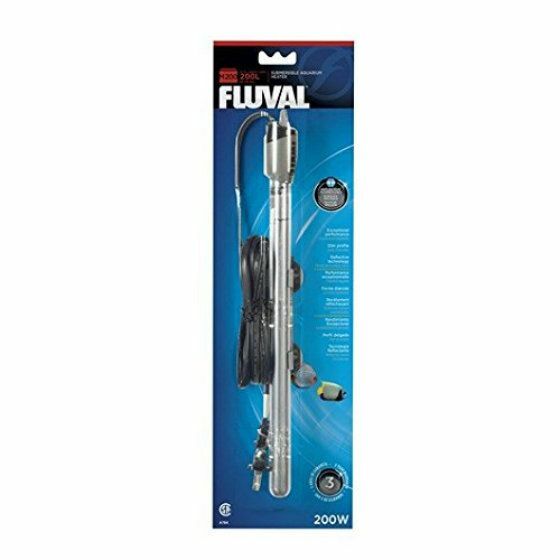 This super slim and tall heaty tube made by Fluval is a great 200W aquarium heater with this model which is suitable for aquarium up to 65 gallons and comes with a 3-year warranty. This heater is ridiculously tall and may stick out most standard size tanks so you may need to just angle it and totally submerge it. The heater also doesn’t come with an on/off light so be sure to get a good thermometer so you can see that the temperature is holding a nice temperature for your fish pals. A nice feature is the built-in mirror finish which helps the heater blend into your aquarium background. Overall it feels more solid and better quality than similar heaters, a great buy. When installing the heater the suction cups allow you to move around on the aquarium glass, which makes things really easy. The heater does a great job keeping the temp constant 75°F even when room temperatures fluctuate between 65°F to 70°F. Overall it’s a great little heater that is easy to read and very easy to install. Shatterproof glass able to withstand extreme temperature fluctuations. The Eheim 200W aquarium heater heats perfectly and is worth the splurge and rated for tanks between 79-106 gallons. A friend of mine and his daughter ended up purchasing this heater and they live in Canada so you know it gets cold during the day. When they aren’t home and the home thermostat is down it apparently has no issues keeping the tank 12 degrees warmer than the rest of the house and they rarely see it fluctuate at all. Set up is easy, just place it in the tank, plug it in and set the heater. 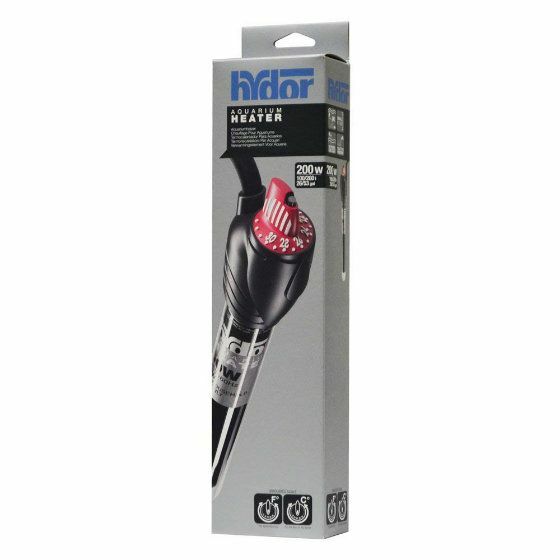 If you end up with this heater you’ll have peace of mind to know it was built in Germany and has a reputation of lasting up to 15 years. This is one of the most accurate adjustable aquarium heaters you can find and great for a tank up to 55 gallons. It’s an awesome heater but might look a bit bulky but it makes up for this with its accuracy. It operates in short burst to maintain and regulate temperature. One friend of mine is thoroughly convinced it’s one of the best aquarium heaters on earth, lol. Seriously though, it’s very reliable even when your house temperature fluctuates a lot. It really is a set it and forget its heater.